Every year, pet parents are warned not to leave their animals in parked cars, which can get fatally hot, even on a temperate day. Yet every year, we hear reports of pets who are subjected to unnecessary suffering because of the selfishness or ignorance of their owners. While the majority of pet parents have the common sense to avoid this situation, there are always those few who refuse to do what’s best for their companions. When this happens, it’s up to us, the animal advocates, to do what’s best for those who can’t help themselves. And sometimes, springing into action means the difference between life and death. Note: the dog in this photo was not harmed! Although many dog lovers would rescue a pooch in need at any cost — even if that means facing legal repercussions — these penalties can be avoided if you know your rights, depending on the state you’re in. After all, to save a trapped pup, you’ll likely have to damage or break into a stranger’s car. But if you’re able to act quickly and legally, you can hope for the best possible outcome: no legal consequences, plus a life saved. 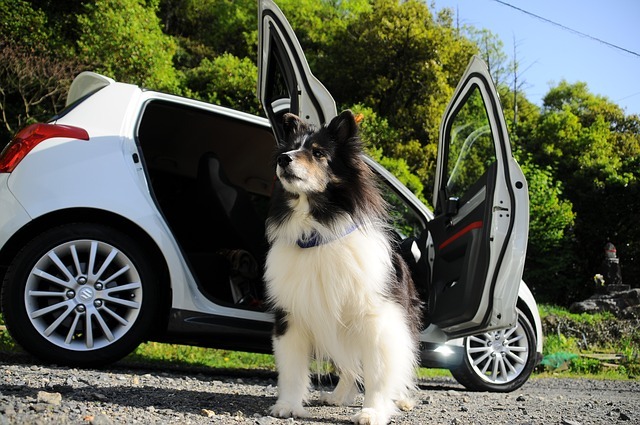 Researching laws can be overwhelming and confusing, but thanks to Animal Legal Defense Fund (ALDF), you can read a clear and concise synopsis on your state’s “hot car” legislation below. The information below has been re-printed with permission from the Animal Legal Defense Fund. You can view the original article here. Such laws do not prohibit confinement at specific temperatures for a specific amount of time. Rather, the provisions tend to prohibit a broad range of conduct, i.e. confining an animal in a manner that endangers his/her health or safety. Arizona: HB 2494 provides civil immunity for persons who rescue a domestic animal from a locked and unattended vehicle after notifying law enforcement. California: Cal. Penal Code § 597.7 and Cal. Civil Code § 43.100 grants civil immunity for any person who takes reasonable steps to remove an animal from a vehicle if that animal’s “safety appears to be in immediate danger from heat, cold, lack of adequate ventilation, lack of food or water, or other circumstances that could reasonably be expected to cause suffering, disability, or death to the animal,” and that person calls law enforcement after entry. In addition, criminal immunity applies if that person takes certain steps first, such as contacting law enforcement, has a good faith believe that the entry is necessary, remains with the animal in a safe location, and uses only as much force as necessary. Colorado: Co. Rev. Stat. 13-21-108.4 grants civil and criminal immunity to persons rendering emergency assistance to a dog or cat in a locked vehicle. Florida: Stat. § 768.139 grants civil immunity for damage to the vehicle for a person who “enters a motor vehicle, by force or otherwise, for the purpose of removing a vulnerable person or domestic animal,” as long as certain conditions are met, such as first calling 9-1-1, using no more force than is reasonably necessary, and remaining with the vulnerable person or animal in a safe location near the vehicle until law enforcement arrives. Indiana: IC 34-30-30 provides that a person is liable for one-half of the cost of repairing the damage to the motor vehicle directly caused by the person’s forcible entry but is immune from any further civil or criminal liability for removing a domestic animal in a locked vehicle if certain conditions are met. Massachusetts: Mass. Gen. Laws ch. 140, § 174f (Effective November 17, 2016) grants civil and criminal immunity for entering a motor vehicle to remove an animal if certain requirements are met, such as making reasonable efforts to locate the vehicle owner and notifying law enforcement. Ohio: Ohio Rev. Code Ann. § 959.133 grants civil immunity for damage resulting from forcible entry of a vehicle “for the purpose of removing an animal” or a minor from the vehicle if certain conditions are met, including having a good faith belief that the animal is in imminent danger, making a good faith effort to call 9-1-1 before entry, not using more force than is reasonably necessary, and making a good faith effort to leave notice on the vehicle’s windshield about the reason for entry into the vehicle. Oregon: HB 2732 grants criminal and civil immunity to a person who “who enters a motor vehicle, by force or otherwise, to remove a child or domestic animal left unattended in the motor vehicle,” if that person has a good faith belief that entry is necessary to rescue the child or animal from imminent danger and that person takes certain steps before entry, such as contacting law enforcement. Tennessee: Tenn. Code Ann. § 29-34-209 allows persons to break into cars to save children or animals. Specific steps, including searching for the owner and notifying law enforcement, must be taken to qualify for protection under the law. Vermont: 12 V.S.A. § 5784 grants civil immunity to a person who “forcibly enters a motor vehicle for the purpose of removing a child or animal” if that person takes certain steps, like calling 9-1-1 and first determining that there is no reasonable method for the child or animal to exit the vehicle. Wisconsin: Wis. Stat. § 895.484 prevents Good Samaritans from being sued for breaking into a vehicle to rescue a pet or child, but only if police are contacted before the break-in to make sure the pet or child is really in danger. HB524 would provide civil immunity for persons who rescue a domestic animal from a hot vehicle. “Hot car” laws are becoming increasingly more prevalent, with eleven enacted in just the last two years and two more pending. While only eight states currently allow concerned citizens to break into vehicles to rescue an animal, prosecutors may be reluctant to bring charges against rescuers, given the public relations nightmare and scant chance of a conviction. In Georgia, for example, charges were dropped against a man who smashed a car window to rescue a Pomeranian mix who was in distress. In states without hot car laws, perpetrators may still be prosecuted under the general anti-cruelty laws. In Lopez v. State , the defendant left his dog in his car on a hot day to go and watch a movie in a theater. Though Texas does not have a “hot car” law, he was ultimately convicted under the state’s anti-cruelty law. Special thanks to the Animal Legal Defense Fund for granting permission to share this valuable information. The ALDF’s mission is to protect the lives and advance the interests of animals through the legal system. ALDF.org is a wonderful resource to research animal rights lawsuits, laws, and much more. If you’d like to help them continue their life-saving work, you can donate here. Share this blog with all the pet parents you know – it’s important to know your rights!